So, it is no secret that I love this game. I was a Kickstarter backer for the company back when I first hear about it. I stood by anxiously awaiting the release. I followed every update, every post and every page I could find. Finally, the night of release came and I sat there refreshing my screen until the servers opened and immediately jumped in. Only to have the game crash repeatedly. I got into a game, but nothing like I had hoped. It was kinda a crushing letdown. In Friday the 13th: The Game, you and seven other players (randoms or your own group) enter into one of three maps. 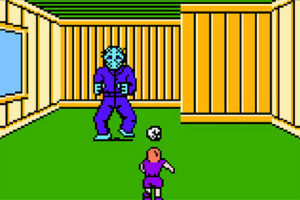 As the game starts, one player is chosen to take the role of Jason Voorhees while the rest take on playing a camp counselor. The counselors are scattered throughout the map and must find a way to survive. They can repair one of the cars or boats by finding the correct parts. They can fix the phones and call for the police. They can let the game timer expire, thus surviving the night. Or they can find a way to kill Jason (not an easy task). As Jason, the goal is simple: don’t let the counselors complete the previously mentioned objectives. You may think that seven on one is not great odds, but Jason has several abilities that shift the odds into his favor. Jason can sense players who are hiding in buildings or running in the woods (making them glow red for a short period of time). He can morph, which allows him to instantly teleport on the map to any location he wants. Another ability is to shift, which allows him to quickly cover short distances, an ability that reminds me so much of the Evil Dead film franchise (if you don’t know what I mean, you just need to play the game and see this ability in action). Jason can also stalk his prey, reducing his fear radius and increasing his hearing ability. Finally, Jason has rage, which builds up over time. Once filled, Jason can destroy doors and walls in a single hit, making him the ultimate predator. All these things sound awesome, right? I totally agree. And I had a year of waiting to build up the excitement. So, you can imagine how the opening few days felt when there were constant crashes, missing achievements and buggy action. Started to lose hope in the game. Luckily, Gun Media, the maker of the game, stepped in and addressed the issues. On June 19th, they made an announcement that they would be rolling out a major fix for the game, as well as adding a new skin for Jason. They also said that the weekend of June 23-25, all experience gains would be doubled and that all players would get 13,000 customization points to spend. These CPs are used to buy abilities for counselors and some of the more gruesome kills for Jason. They also added a more techno soundtrack for when the new Jason skin is used by the killer. The new Jason skin was the talk of the town. 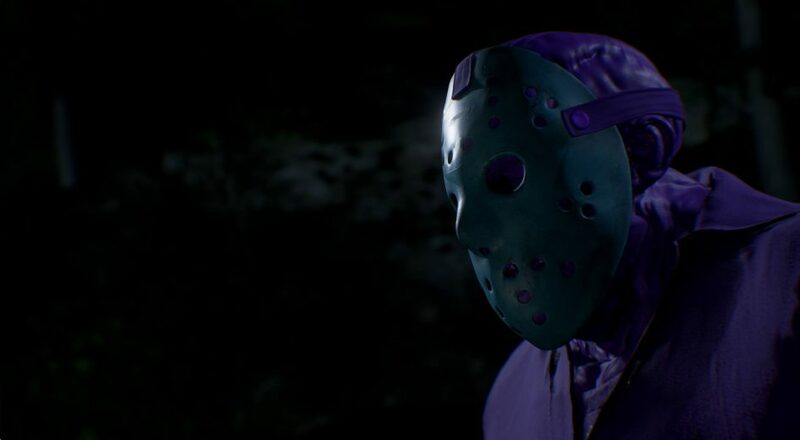 It makes a change to the appearance of the default Jason character, turning him into a purple nightmare. Yes… I said purple. They call it “retro,” in that it is a direct homage back to the 8-bit adventure of the Crystal Lake Killer on the original Nintendo game back in 1989. Not many people playing today even know what a Nintendo is, let alone there was a Friday the 13th video game, but for those of us who grew up on Atari, Nintendo and Sega, it brought back some memories. Thus far, reviews of this update have been mixed. Some players love the fact they get this new skin for free, and that some of the bugs and hacks in the game have been addressed and fixed. Other players absolutely are not satisfied. They feel that the purple killer skin was a cop out, as many want the Tom Savini Jason made available (this model was offered for a short time for Kickstarter purchase). They also feel the developers have not gone deep enough to fix some of the glaring issues in the game. As for me, I am always appreciative when given something for just being a player of the game. Is it everything I could have wanted? Nope, but I feel that given the game has not been out that long, the developers are being very upfront and helpful in getting this game more content and a better playing field. Will they please everyone? Nope. Some people just cannot be made happy. I just hope they do not try to over appease players and make changes to the fundamentals of the game. Jason is supposed to have a lot of powers at his disposal. He is supposed to kill players easily if he finds them. Don’t change that aspect. Counselors should always play the game on edge. Friday the 13th: The Game is available on PC, XBOX and PS4. Get your copy today!